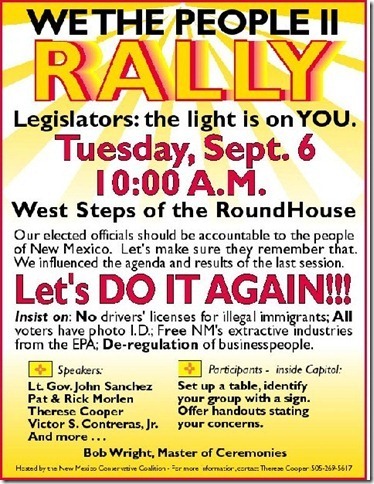 Governor Martinez announced on Friday (12/09/11) she will once again introduce legislation to revoke the state law which permits illegal aliens to obtain driver’s licenses in New Mexico. She said she would do this during the state legislative session next month. Her earlier attempt to pass such legislation was hampered by the intransigence of the Democratic majority in the state legislature, as well as the extra-special efforts of Speaker Lujan in the House of Representatives. I believe all residents of our state are sympathetic to the plight of the illegals who come in to our country. Many of these illegal border crossers are of good character and are just seeking a better way of life away from the corruption and drug cartels which have become so entrenched in the daily lives in their home country. We need to be compassionate, if possible, until we can help them back across the border to their own country. Unfortunately, this does not allow us the luxury of forgetting the potential security risks that our open borders bring with them, not to mention ignoring the many serious crimes committed by those who are criminal offenders. According to the U.S. Business Council and Fox News, the 9-11 Commission documented that 18 of the 19 terrorists who participated in the 2001 attack had what appeared to be valid drivers license’s or state I.D. Cards. These documents provided these self-professed martyrs with unrestricted travel privileges and the identification which enabled them to take part in the flight training they needed to carry out their cowardly attacks of 9-11. Perhaps inadvertently, but some U.S. State authorities did indeed assist the 9-11 terrorists in the accomplishment of their cowardly mission. New Mexicans have a chance to enhance state and national security. Keep in touch with your elected officials and support what our perceptive Governor is trying to do!